Hidden inside the black light-proof covering is the imprint of a negative on photographic paper. The negative was taken from the collection of my mother who passed away last year. 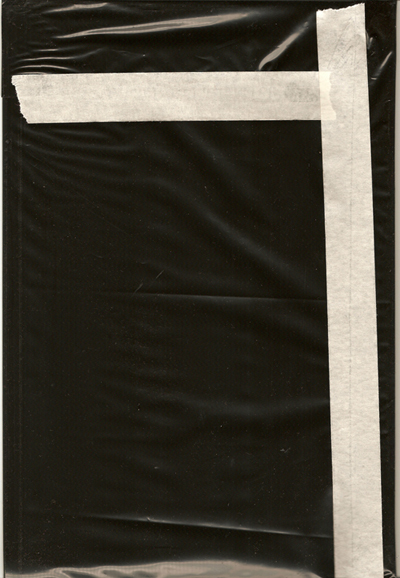 The photographic paper has not been treated with the usual chemicals meaning that while the print of the negative exists inside the light-proof envelope if the envelop is ever opened and the image exposed to light it will disappear within seconds. Like Schrödinger's cat the photograph both exists and doesn't exist at the same time. As the experience of the real person is replaced by the experience of the memory of that person so the experience of the real photograph is replaced by an idea of the photograph.